It feels so good to get rooms completely decorated! That seems to be how I’ve been working best as we slowly finish Our DIY House: one room at a time. 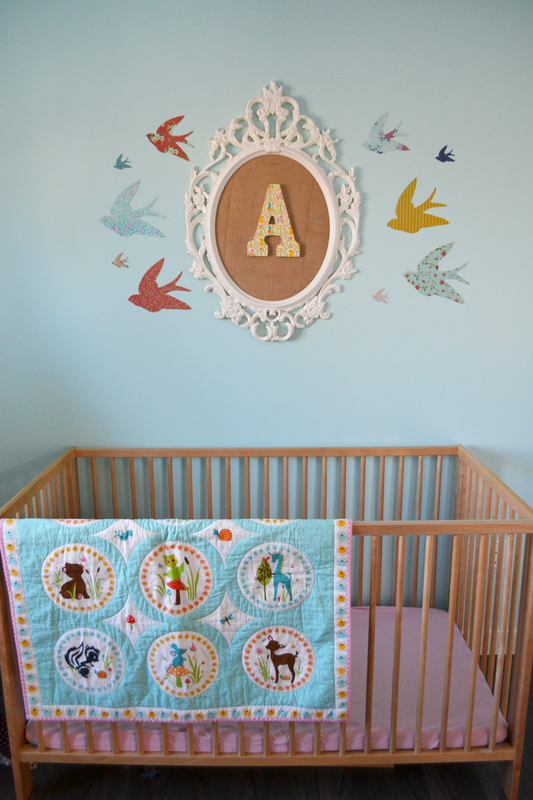 Little A’s room is probably my most favourite room so far – it’s fun & happy with so many simple DIY elements! I’m also happy that I finished it before I moved onto Baby Three’s. I really, really wanted Little A to have her own special space and I knew it would be hard to finish once the new babe arrives. Remember my mood board for this room? 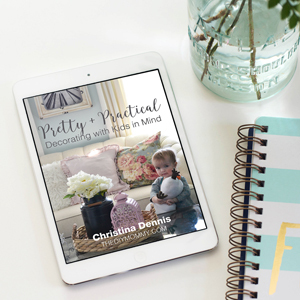 I used it for inspiration, and stuck to cheerful colours like aqua, yellow, soft pink, chocolate brown and white for the decor. 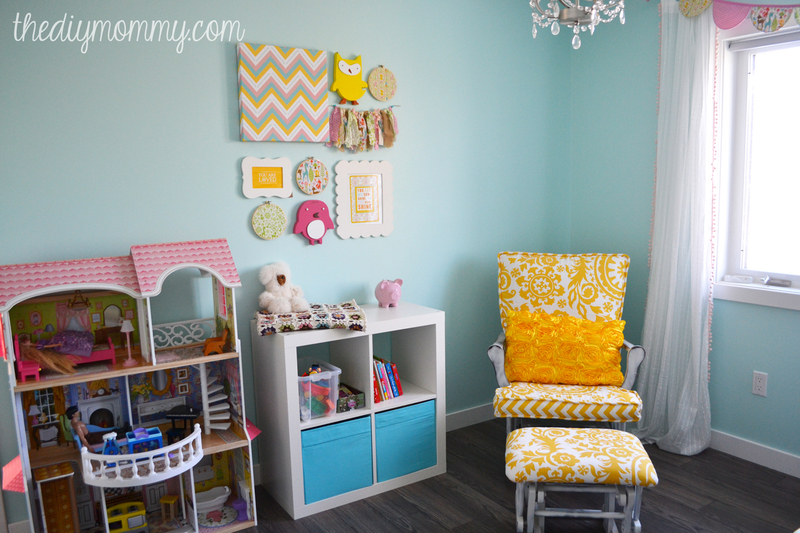 I recovered the rocking chair and gliding stool last year and it sits in one corner of A’s room. 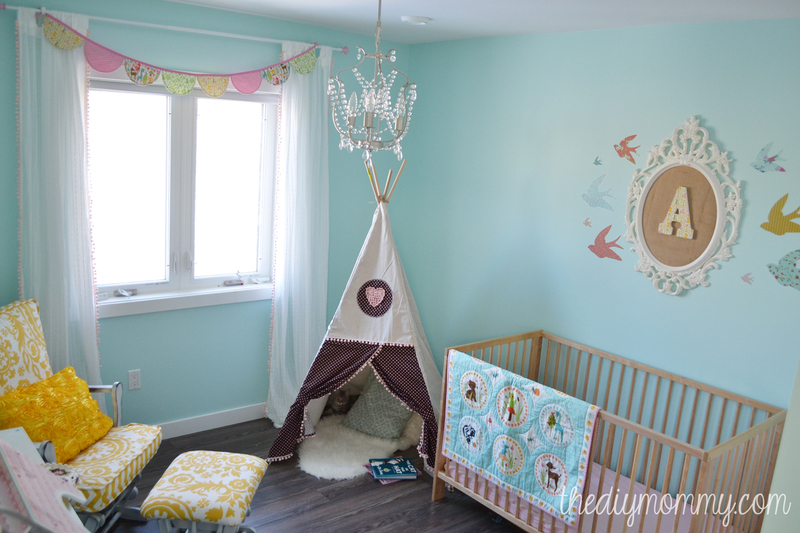 The sweet chandelier is from Ikea, the curtains are also from Ikea (with pom-pom trim sewn on), and the scalloped bunting banner was a simple DIY. 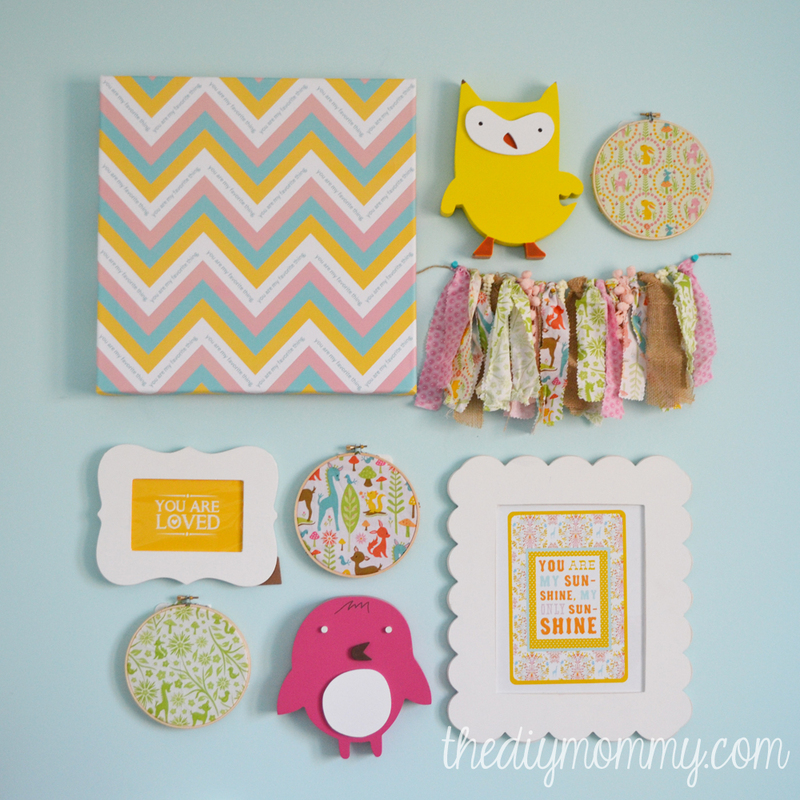 I really love this gallery wall! 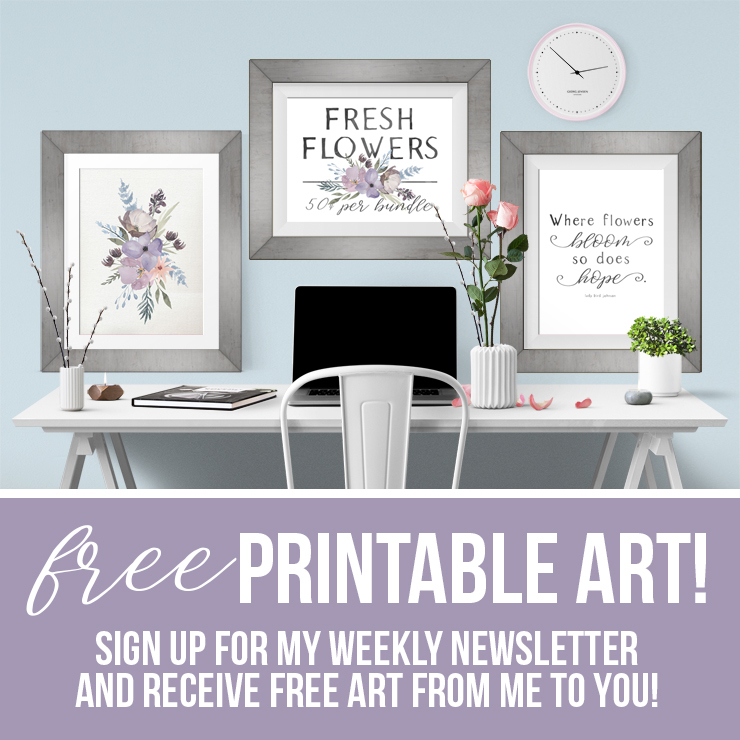 It features art from Fizz & Bean, little animal art I picked up at the Real Canadian Superstore last year, a simple no-sew scrap fabric banner (similar to this DIY), a Katie Daisy print, some embroidery hoops of fabric, and a framed print (of this free printable I made). 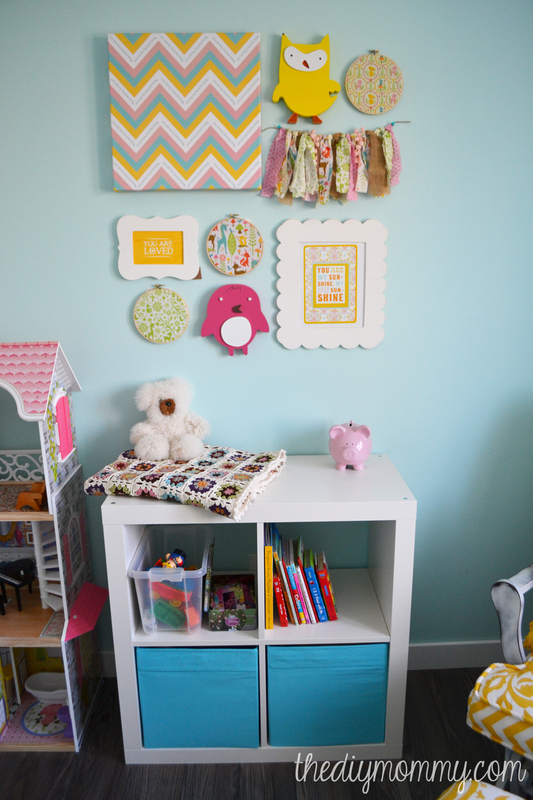 The gallery wall sits over an Ikea shelving unit filled with Little A’s favourite books and bins of toys. In the opposite corner of the room is this DIY teepee I made a couple of weeks ago. It’s turned out to be a huge hit with both of the girls! I love how it matches the woodland theme of the room and gives Little A a place to curl up and read. The crib is from Ikea (I bought it for my first daughter 5 years ago). I was tempted to paint it, but it turned out that I actually liked how the natural birch colour looked with Little A’s aqua wall colour and dark floors. The quilt was a simple DIY, and the framed monogram print was also made by me in an afternoon – I’ll share the quick tutorial very soon! I found the sparrow wall stickers at a liquidation store and thought they matched so nicely with the room. 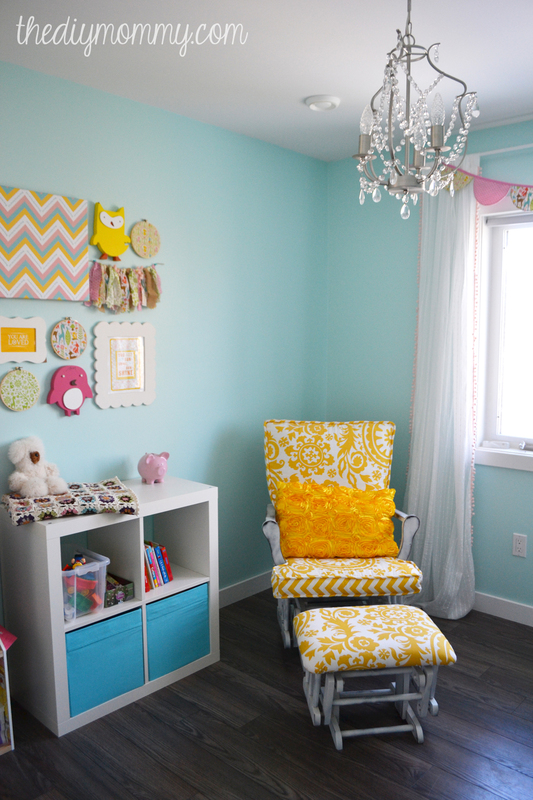 Now I feel like I can happily move on to finishing Baby Three’s new nursery. Little A is happy with her sunny new room, and I feel good knowing that it’s all finished before I get overwhelmingly busy with our new baby! I don’t know for certain, of course, but I feel like Baby Three might come a little earlier than her expected due date of February 25th. I don’t want to count on it (because I’m so uncomfortable and antsy already), but I have a feeling… We’ll see what happens! Love it! So fresh and youthful! Thanks, Sara! I’m really loving this colour combo. Such a pretty room! Love love love the colours, especially all the yellow. What a happy space! Thank you! I love the colours too – they’re so cheerful! What is the wall color? I love everything about this room! Thanks, Laura! It’s Mystic Sea by Valspar. I just love it!